There’s not an official site. 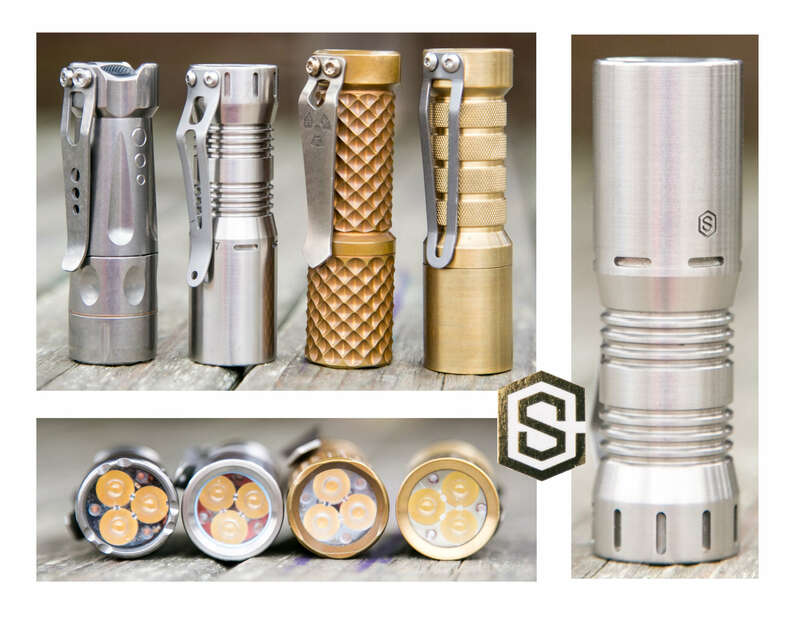 I got in on a drop from CandlePowerForums, but most often lately, they’re available at UrbanEDCSupply. Here’s a link to a the latest sold out item. 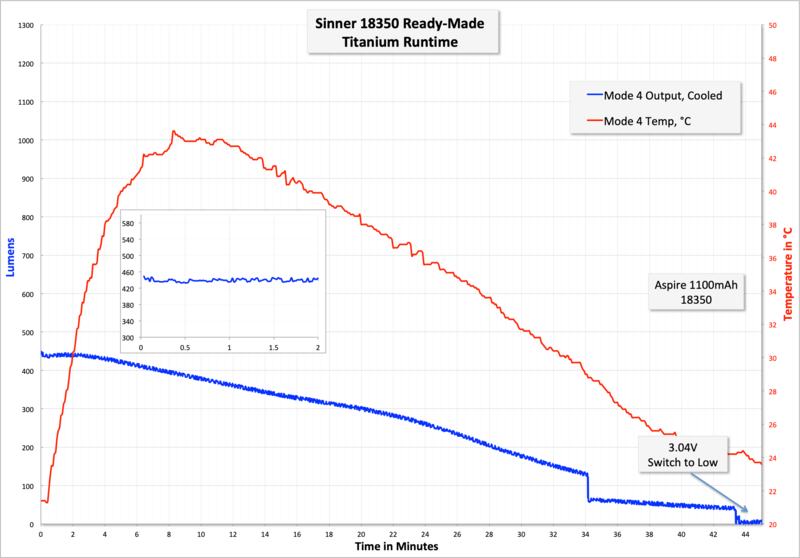 Sinner has made a few different lights, but the one I’m reviewing here is the 18350 Ready-Made Titanium – the others have different names. As this is a custom of sorts, there could have been and could be many versions. Including shipping, I paid $516.75 for this light. I like this light more and more every time I carry it. Is it worth $520? 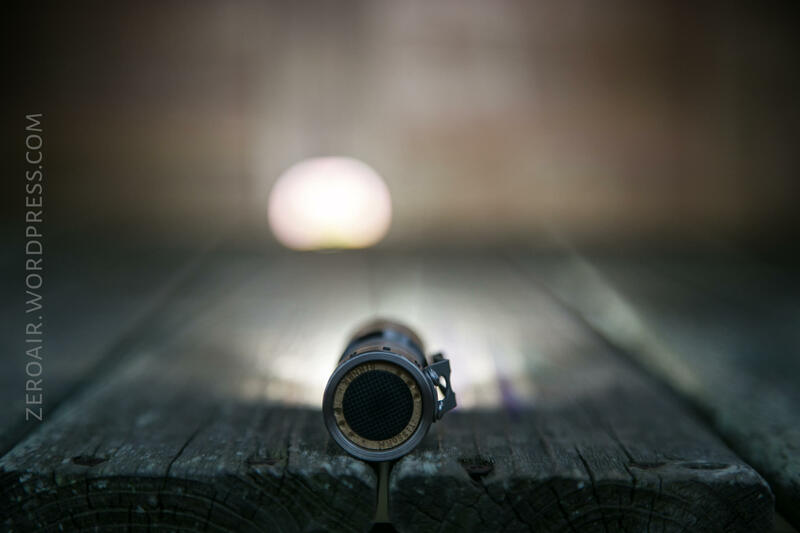 As a flashlight? Of course not. As a piece of pocket jewelry, I’d argue that yes, it is probably worth $520. 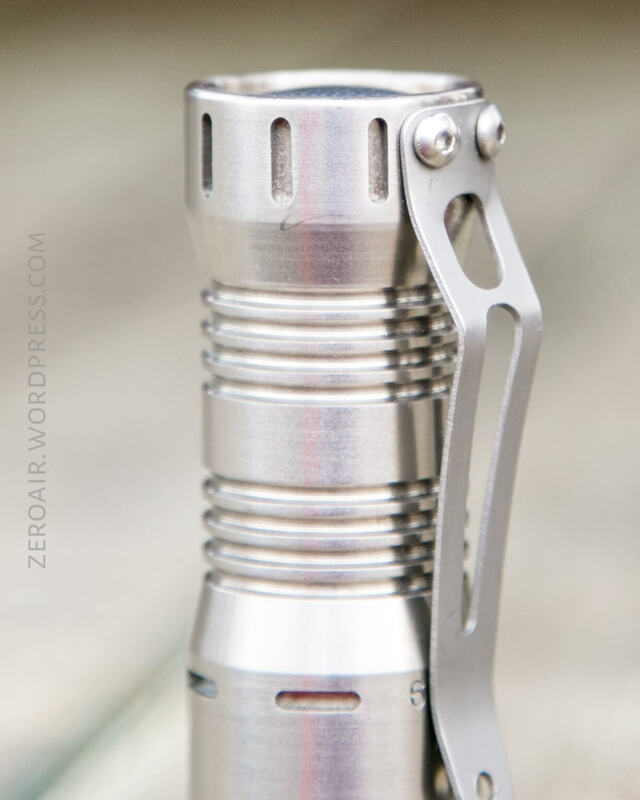 It’s well made, very pretty, and can be further adorned with tritium easily. The light ships in a custom cardboard box. I say “custom” because the front of the box has a personalized sticker with the buyer’s name and address – to be honest, quite special. Inside the cardboard box is another gold embossed box, which contains the light. There’s an instruction sheet, which can be seen below, on the inside of the bigger box. 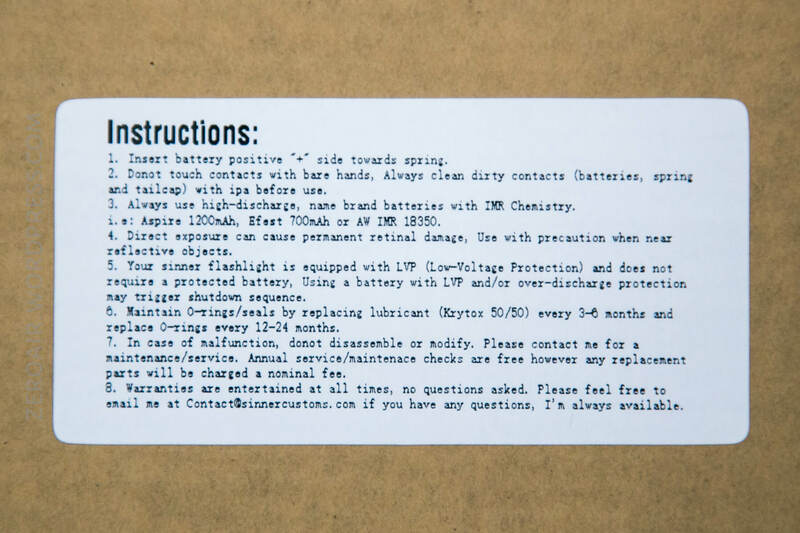 The flashlight box itself has a very detailed label of the specifics of this light. I find that very compelling – many other “finer” lights I have have not had this level of detail. And while the details of those lights are known, they aren’t kept up with in such a nice way. The build of this light is impeccable. It’s just a gorgeous light. If had one thing to do differently about this light, it’s that the grooves (and probably trit slots too for that matter) would have the edge knocked off just a shade more. I’d say the same thing about my Haiku, too. This could be seen as grip, but I’d rather have it knocked down a shade. The head has a thin but stiff spring. It’s possible to remove the pill by unthreading it. 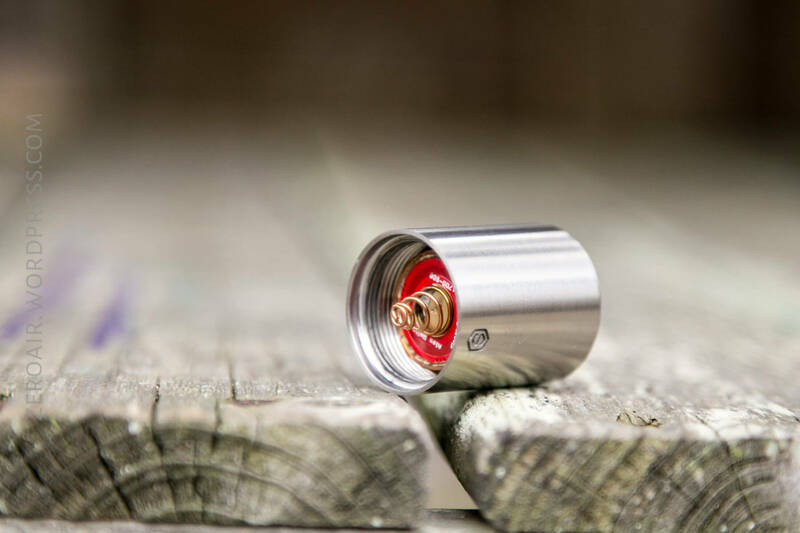 The pill is solid copper. The board is custom – labeled “Sinner Customs,” “Alex Wells,” and a part number. I’ll be honest I have no idea who in the world “Alex Wells” is but it’s not the maker of this light. Maybe of the electronics? The tail of the light does not have a spring. It has an unsprung brass button. I have .. ahem… a number of comparable lights, and the Sinner is on the smaller end of the spectrum. I appreciate that, since one of my complaints about these 18350 “custom” lights is that they’re comparatively large. Among the choices below, the Sinner is not only tied for cheapest, it’s also the only one which comes prepared with tritium slots. 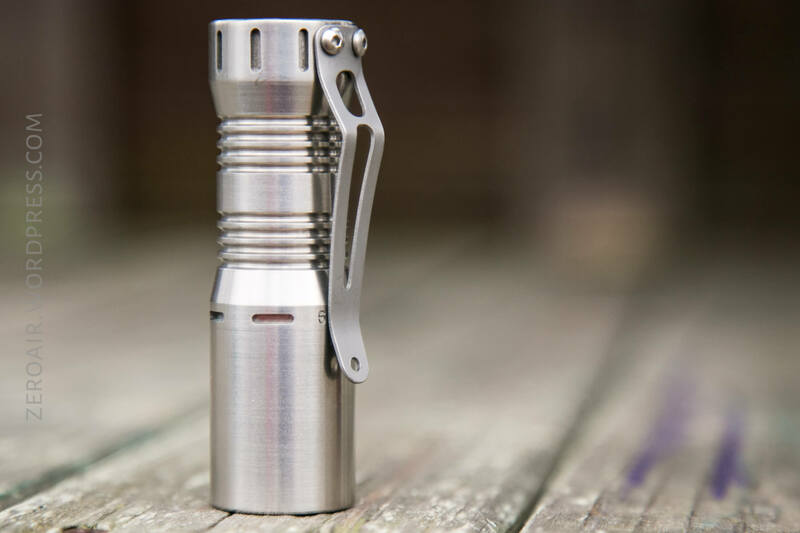 The only included means for carrying this light is the already-attached pocket clip. 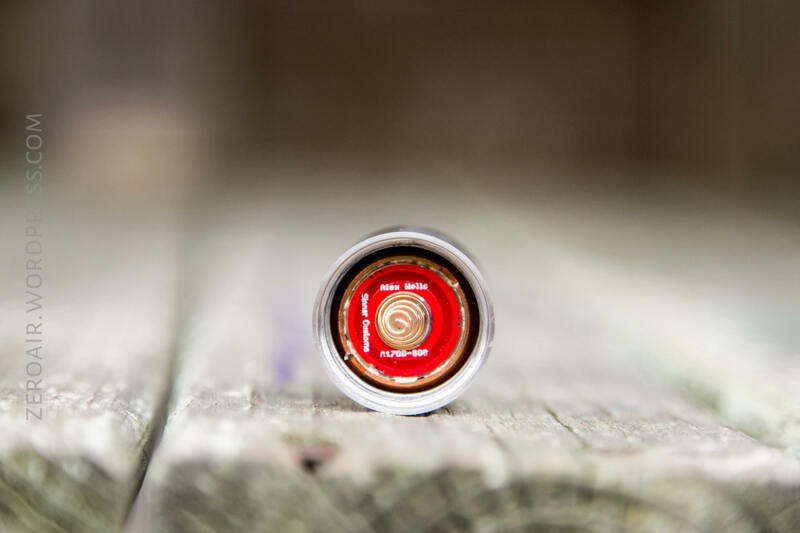 It’s a basically standard fare pocket clip…. except it’s completely titanium (boom) and also even the screws (Hex) are titanium, too! (As far as I know the documentation doesn’t state this, so it could be that the screws are actually stainless [the not magnetic kind]). 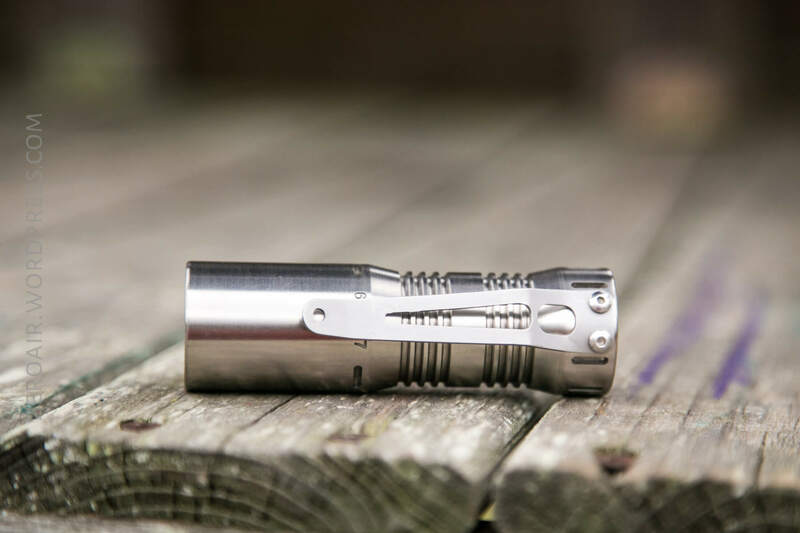 A titanium pocket clip is a super nice touch! The clip is thin but springy, and has a nice open mouth. It holds well, but is not a deep carry clip. 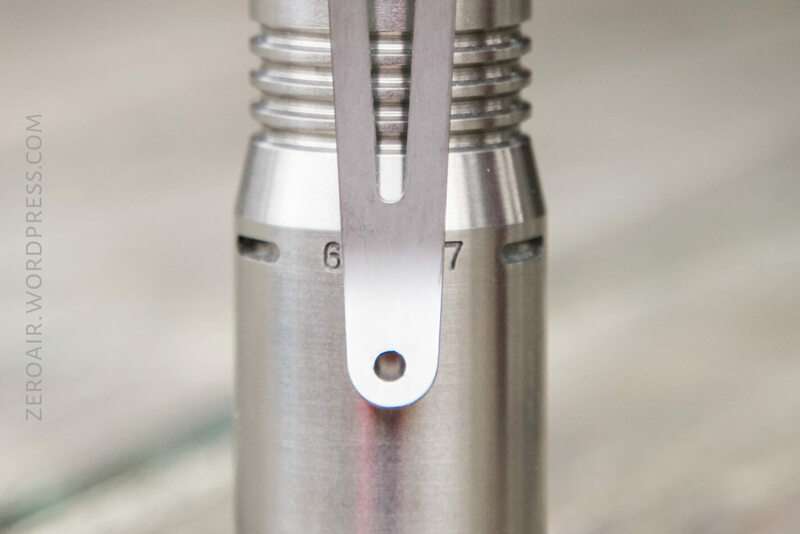 I believe this is standard spacing on the screws (so you can put any kind of tacky skully clip you want on it). The light is powered by the cell mentioned in it’s name: an 18350. 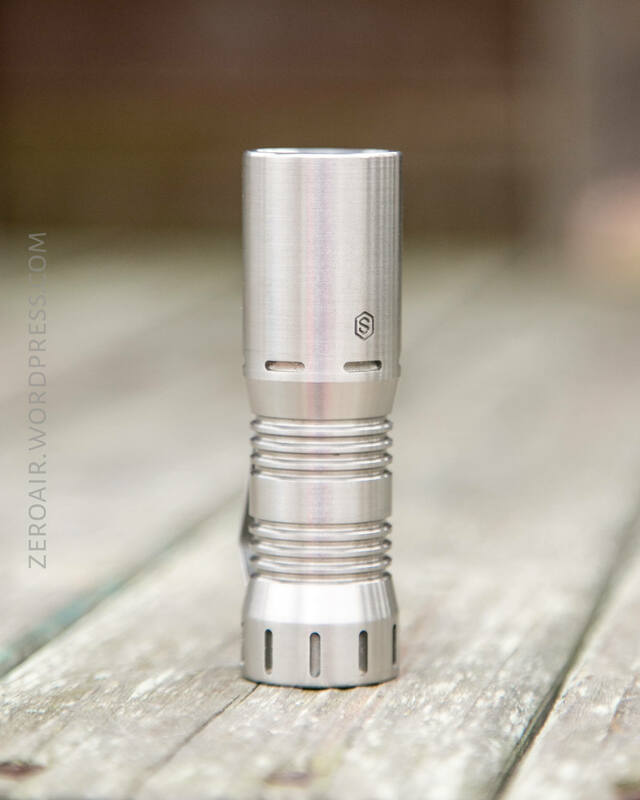 I tested with an Aspire 1100mAh flat top, which should be capable for this light. Turbo lasts for just over 30s, and I show about 1150 lumens at 30s. 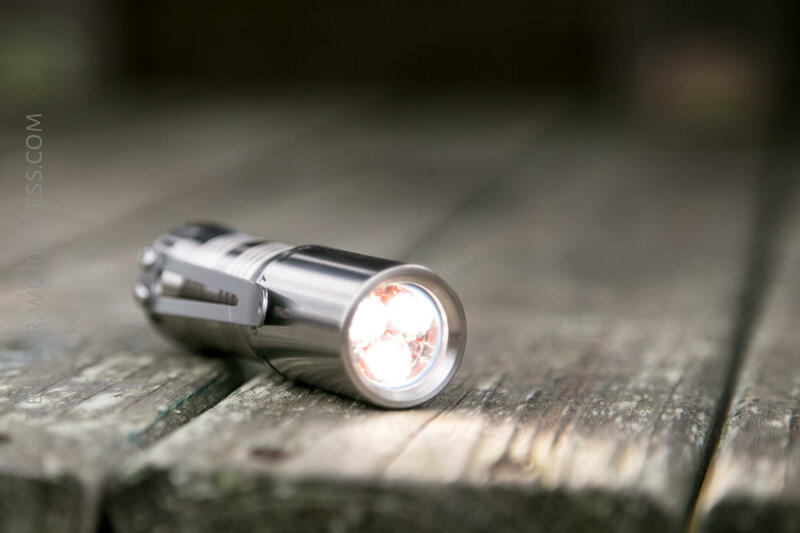 The stepdown is to around 450 lumens, and then the output gradually declines thereafter. A few stepdowns and then very low output end the runtime. At the point I stopped the test (well under 10% of the initial output), the cell voltage was 2.94V. The temp of 46 degrees C is noteworthy, though not actually all that hot – certainly not too hot to handle. The next highest mode (not strictly speaking called “High”) has a similar profile, excluding the initial output of Turbo. The light does have low voltage protection, per the spec sheet included on the box. I confirmed this with the bench power supply. At around 2.7V, the output flashes slowly. At around 2.6V, the output shuts off completely (and electrically, too). 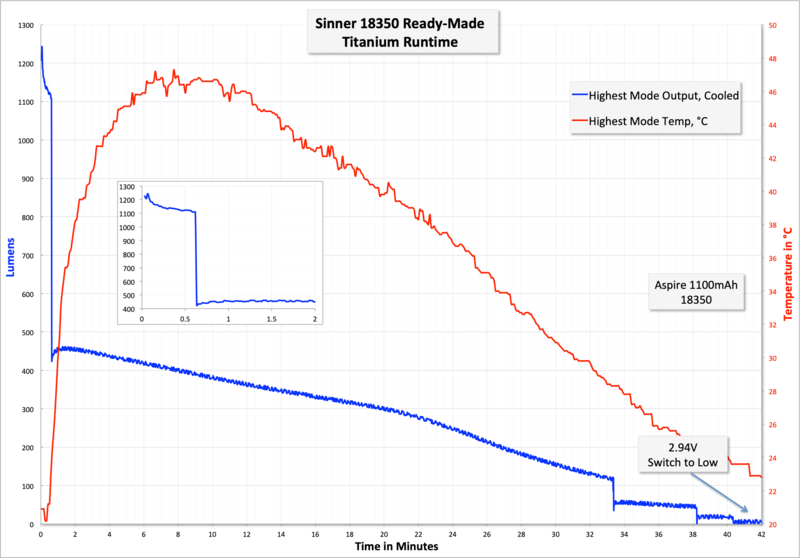 This 2.6V cutoff is a little low, but not outside the specification of most 18350 cells. That’s a very simple UI. That’s the downside of this light – all the other accoutrements the light has, the driver is painfully simple. At the very least, I’d love to see a H17f, which I consider the bare minimum of driver for this class of light. Some would reasonably argue that this light is built for driver changes – it should be simple to do so, but not free! (Just $17 at mtnelectronics.) (And I wish I hadn’t looked it up, because now I want that in this light). Regarding the current on Turbo – the documentation says the max is 7.5A. I limited the bench power at 8A, and the light easily took that – so much so that there was heavy voltage sag. I’m not willing to push past that, and so we’ll call it good at 8A, k? Also a note here – another complaint about the driver. Low is much too high. I want a much lower low than is offered by this driver. 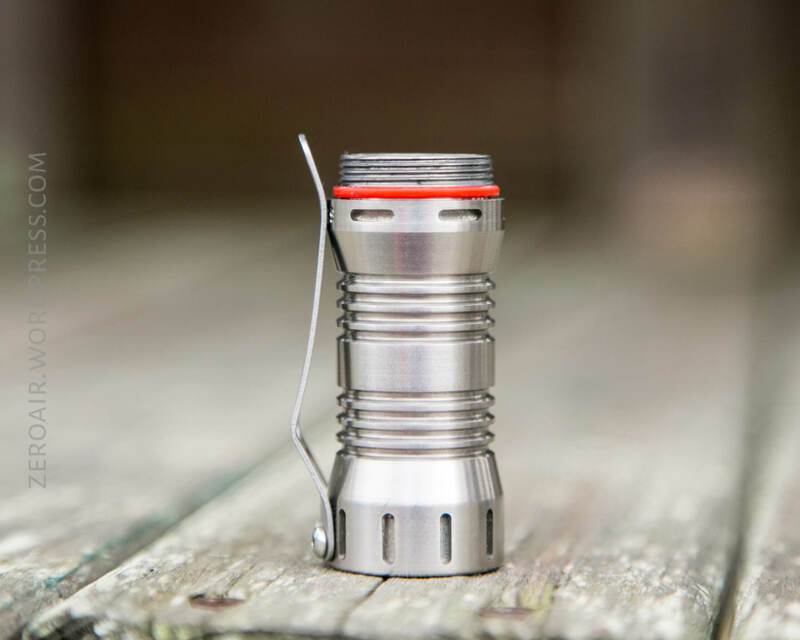 Sinner has chosen to use three Nichia 219c’s in this 18350 light. They’re 5000K, and 90+CRI. The optic is clear and while not stated, probably the narrow option. The beam is everything I love about TIR’s. Almost no spill, and an even beam across the spot. The photo above (and below) show some reasonable comparisons to this light. 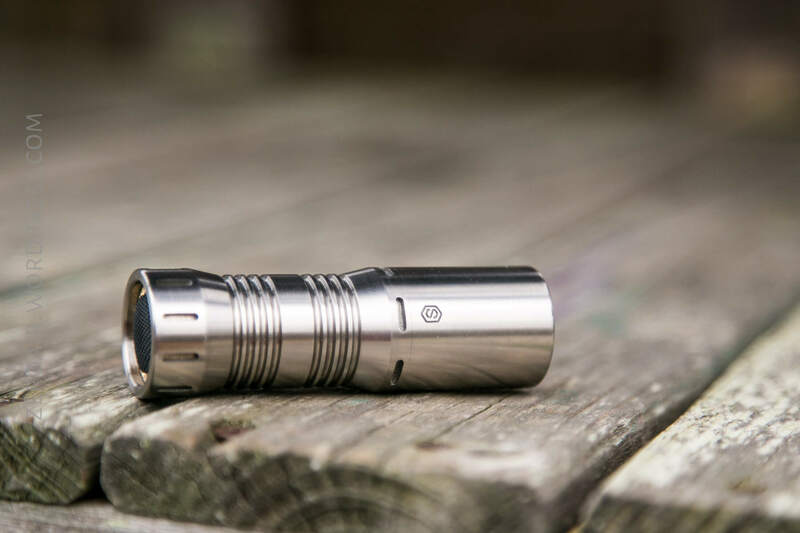 The Okluma DC1, also available in titanium (probably as frequently as the Sinner is available, anyway) is a close competitor. 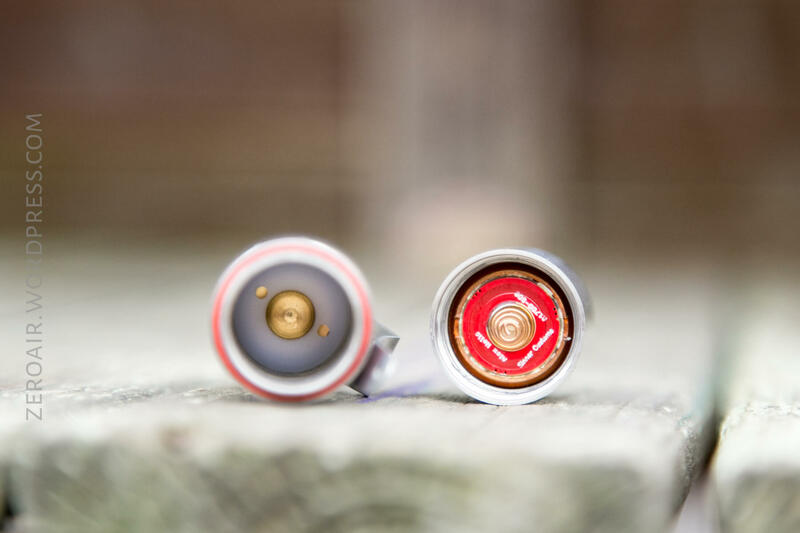 The Hanko lights are very similar too (longer, but narrower), and now they are stock H17f lights, too (for an additional $300, of course). (For the difference in price it’d be easy to pay someone to install a H17f in your Sinner.). The BOSS is another triple available with 219c, but the vastly different driver separates it (it’s also more expensive). Another reasonable comparison would be a McGizmo Haiku with a Tana triple conversion – that puts the McGizmo into the price range of the Sinner, but involves a bit of custom finagling. I truly like this light more every time I carry it. I would not put this light in the same class as the TorchLAB BOSS, as the driver separates them. 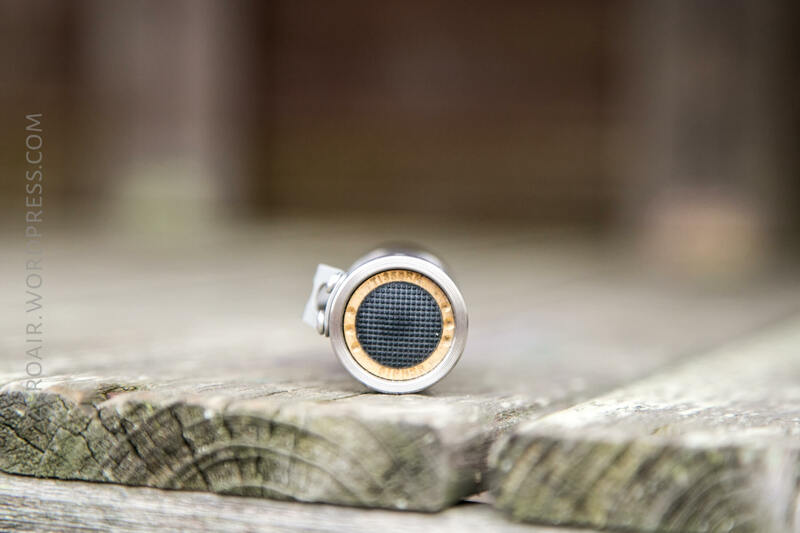 But among the other three, the Sinner probably represents the best value (if you value tritium slots). I have my mind set on finishing two Nitecore chargers for next week. And my other non-flashlight days will be a couple of cells. 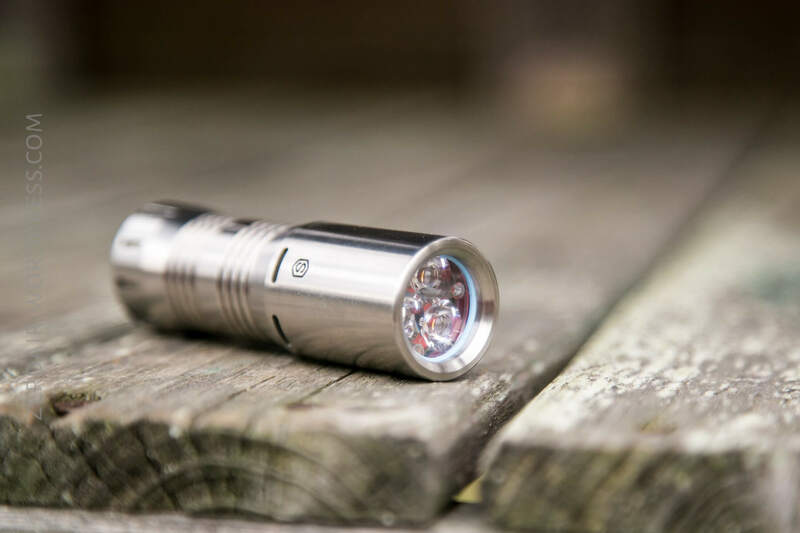 Oh and as usual, I’m aiming for MWF flashlight reviews, too!! I bought this light with my own money for the purposes of my own personal enjoyment. 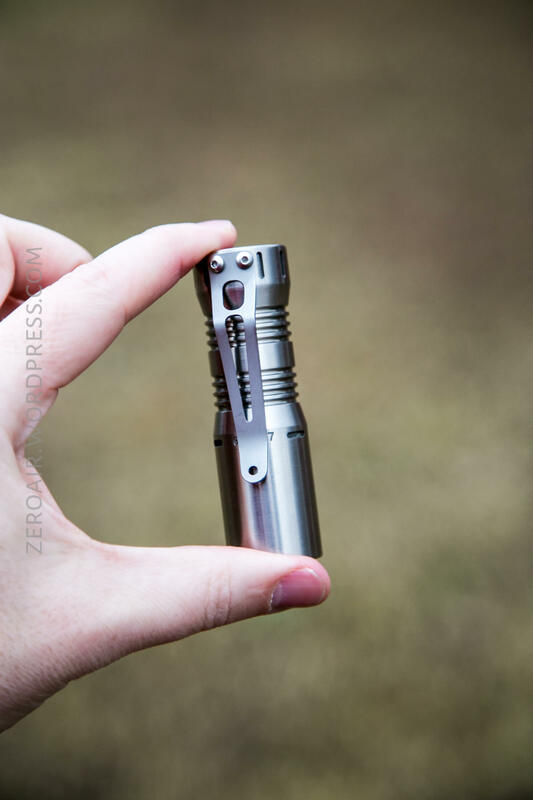 I didn’t buy it for the purposes of Fun Fund Friday, but I find it fun to finagle fantastic flashlights into this format.